To mark the premiere of Game of Thrones Season 7, London Underground customers will now experience a little bit of winter as the HBO series visits four central London Tube stations and travels along the Jubilee line. The Northern line ticket hall at King’s Cross St. Pancras Tube station has temporarily been transformed to accommodate The Iron Throne, where customers can have their picture taken. The station is also hosting a band busking the theme song and 1,000 lucky customers will receive a free Game of Thrones travel wallet. The new season’s creative will feature on walls, columns and floor vinyls, as well as digital screens and escalator panels at King’s Cross St. Pancras Tube station. Public service announcements will also be made in a familiar Northern voice. 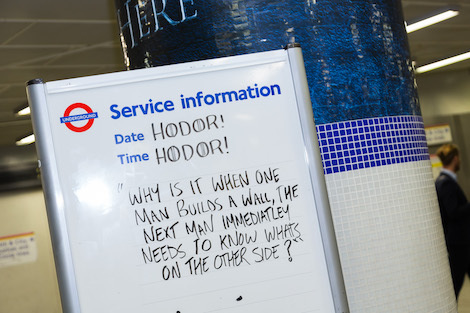 Throughout the day, chaperoned White Walkers, Henchmen and the Night King can be spotted at Waterloo, Paddington, Liverpool Street and King’s Cross St. Pancras Tube stations. 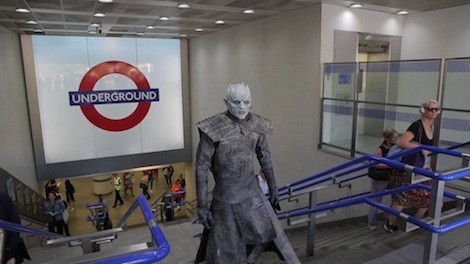 The Transport for London (TfL) Film Office is also accommodating a film crew capturing a White Walker travelling on the Jubilee line. This activity is part of an experiential Sky Atlantic advertising campaign on the Tube booked through Hello London, the media partnership between TfL and Exterion Media. Hello London provides creative, bespoke advertising opportunities, like this one, to an audience of over 1.5 billion on London Underground, London Overground, the DLR, Tramlink, Victoria Coach Station and, from 2018, the Elizabeth line. Through Hello London’s innovative approach to technology and transforming the physical advertising assets in station environments, advertisers increasingly have more flexible and dynamic opportunities to connect with their target audiences, while helping to generate vital revenues to invest in London’s transport network. All advertising at Kings Cross, Liverpool Street, Paddington and Waterloo was booked with Exterion Media. Station advertising will run at these stations for two weeks from July 17, 2017. Experiential advertising, which includes The Iron Throne experience, filming, busking, give-aways and PA announcements, was booked directly through TfL. All experiential activities, including The Iron Throne at Kings Cross, will be open to customers from 07:00 – 19:00 on Monday July 17, 2019. This entry was posted on Monday, July 17th, 2017 at 15:02 @668 and is filed under Scuttlebut. You can follow any responses to this entry through the RSS 2.0 feed. You can leave a response, or trackback from your own site.